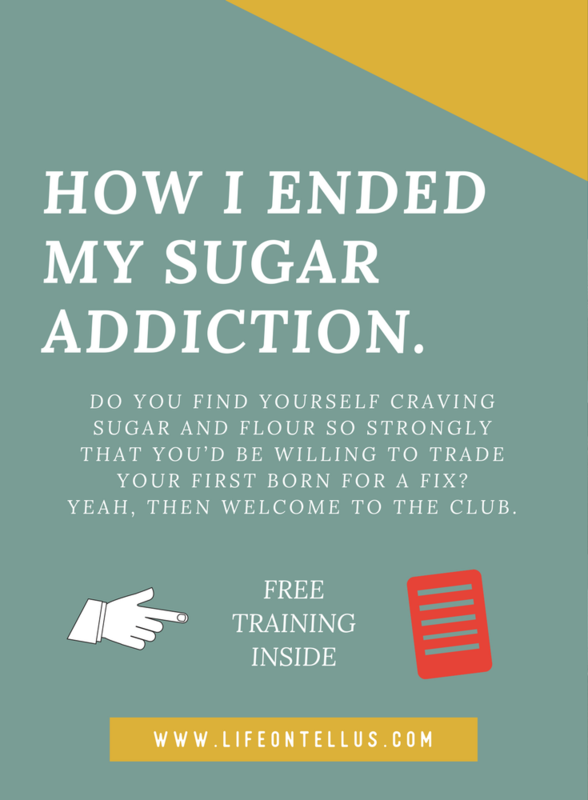 Do you find yourself craving sugar and flour so strongly that you’d be willing to trade your first born for a fix? Yeah, then welcome to the club. I was in your shoes. Desperately seeking a solution to my sugar addiction and frustrated at how unsuccessful I was at finding one. I remember thinking, How hard can it be to quit sugar? I’ve done harder things in my life. I quit smoking for crying out loud. That was a nasty habit and it took a tremendous amount of willpower to stop. I’ve also given birth three times. That should be my biggest accomplishments. But no, apparently walking away from the pull of food, from the pull of sugar, was going to be my life's work. Who knew? The universe works in mysterious ways and now looking back, the dots do connect. Like Steve Jobs said, in his Stanford commencement address, ”You can only connect them looking backward.” Truth. I bet that you and I are not very different. I bet that you, just like me, have tried every diet on this planet. I bet that you, just like me, have struggled with saying no to food. I bet that you, just like me, wake up every morning with a new resolution, that today is the day you'll eat perfectly. ”Today I’m gonna follow my food plan.” But by the end of the day you, just like me, find yourself stuffing your face with all the Ben & Jerry flavors. Yeah. Because life’s not worth living if there’s no fluffy cold creamy deliciousness involved. We've all seen Groundhog Day. I'd wake up, commit to the latest diet, stick to the diet until the afternoon, give up because ”so much suffering”, eat ALL the foods, then feel like a total loser. Next day, rinse and repeat. At one point I was so desperate that I joined a food addiction group. Finally, I felt at peace. Hello, friends. Where have you been all my life? We group hugged and shared our battle stories. I’d always thought something was deeply wrong with me and now my "wrongness" was confirmed. ”You’re a sugar junkie, sweetie pie. You belong with us addicts. Food addicts need food rules and abstinence. You'll never be able to eat sugar and flour again”. I was a stellar student and the poster child. I got ”clean”, and I held on to the rules and to my abstinence like the stubborn person I am. But after 150 days I couldn’t keep it together anymore. From out of the blue, a force greater than me hijacked my brain and drove me to eat. And eat and eat. Like a starving animal, I ate. I ate all the foods that I wasn't allowed to eat on the food addiction program. And I had no clue what had happened. This is what it feels like to have a relapse, I thought. This is the dark side of being a junkie. The addiction has its claws deep in your core, and I have to surrender to that fact. It's a fact of life with an addiction. There's no cure. You're broken. You have to learn to live with the decease and learn to cope instead. I was hitting rock bottom hard. No hallelujah moment. No grace. Only pitch black darkness. The story isn't over though. In my quest to pick my pieces up (by surfing the interwebs, as you do) I stumbled upon a book called ”Brain Over Binge” by a woman named Kathryn Hansen. To say it radically changed my life would be an understatement. Hansen shares in her book how she, from one day to the other, ended her binging habit. She went from being a food addict to being a...well, non-food addict. How is that even possible? Everything I had learned from addiction was being challenged. In my book, what she did was impossible. You shouldn't be able to stop being an addict and return to normal. I mean, this put everything I knew about sugar addiction on its head. Once an addict, always an addict, right? What Hansen presents in her book is very much based on Mindfulness. Ah! I knew mindfulness. I had been practicing mindfulness, or the art of paying attention, for many years. Now, for the first time, I understood it in a different light. Now I saw how powerful mindfulness could be when it came to ending an addiction. I must confess that this realisation did take me some time. My path to food freedom was not an overnight success. In fact, I was a very slow learner. It took me months and months of mindfulness meditation to strengthen my mind. But boy did it get strong. I was not only able to end the habit of overeating, but I was able to start eating sugar and flour again. Gasp! I managed to do the impossible. According to the food addiction dogma, once a sugar addict, always a sugar addict. I was set free. Not through abstinence, but through mindfulness. Now you might be asking, how? Mindfulness teaches you to have awareness of your thoughts. I’d usually find myself just eating all the Oreo’s with zero awareness of my thinking. Mindfulness meditation taught me how to create space between the thought and my action. Expanding the time between a thought, an impulse to eat all the cookies, gave me time to act accordingly. I started responding differently. I started ”dismissing the urges to overeat” as Kathryn Hansen puts it. When the thoughts ”Have some fun! Live a little! Have a piece of cake!” would pop up in my mind I’d kindly and gently dismiss them. Move on with my new found food freedom. Here's how it works. Every time I have an urge to overeat, I like to use what I call the 3 S's. "Seeing" means having awareness. Noticing what you're thinking. Noticing when your attention goes to food, your body or your weight. It can also show up as images, urges or cravings for particular foods. "Sitting" is a mental state of non-reaction. Simply being with whatever arises without engaging with it. Calmly observing the urge to overeat. Not reacting to it. Not following the invitation to overeat or binge. "Shifting" your attention to the things that matter to you. I like to shift to joy by looking for three things in my life or surrounding that make me happy, right now, at this very moment. For example; Oh, look! A flower. I love flowers! Coffee makes me happy (high five coffee!) and watching my youngest daughter drawing a dinosaur...gah! My heart explodes with joy! That's it. Rinse and repeat. Mindfulness can look deceptively simple but make no mistake. If you've been struggling to end the habit of overeating or walking away from the pull of sugar, then mindfulness will show you the way.